My printer is identified solely as HP Photosmart 6520. There is no e following the number. Will your cartridges for "HP Photosmart 6520e" be the correct ones for my printer? Yes, the cartridges for the HP Photosmart 6520e will be compatible with your printer. I have a HP Photosmart 6520 All-in-One printer and the heads are blocked. Do you have head cleaning inks for this printer? Thank you, L. Darnell. Sorry , we only supply the HP Photosmart 6520 e-All-in-One ink cartridges at this time. We advise you to run a printhead cleaning cycle by following the instructions in the manual in order to clean the printheads before purchasing any additional supplies for this purpose. Is it possible to buy a black ink cartridge on its own for my HP Photosmart 6520 printer? Yes, you can buy single black ink cartridges for the HP Photosmart 6520 e-All-in-One printer, they are listed further down the page if you scroll past the multipacks. Hi, how I can use the bigger HP 364XL cartridges in my Photosmart 6520 e-All-in-One printer? Regards , Grzegorz. The HP 364XL cartridges should be of the same physical size as the HP 364 cartridges, they're just filled with a higher volune of ink so you can install them in the same way as the standard sized cartridges. The HP 364XL cartridges will work instead of the standard capacity HP 364 cartridges within the four separate colour slots of your HP Photosmart 6520 printer. For further intructions on replacing Photosmart 6520 e-All-in-One ink cartridges please refer to the printer manual. There are two prices shown for your products, a single price and one shown to include VAT. What do I pay? Thank you. The price you pay will be the price including VAT unless you're ordering from the Channel Islands. Is it okay to use high capacity printer cartridges in all colours for the HP 6520 e printer? Can I use sublimation inks in the Photosmart 6520 e-All-in-One printer and, if so, where can they be purchased? I'm printing t-shirts and mugs but normal transfer paper dosen't seem to work. Home users and students in need of a printer, copier and scanner can get the HP Photosmart 6520 e-All-in-One instead. The HP CX017B all-in-one printer, as it is occasionally referred to, uses HP thermal inkjet technology and has a maximum resolution of 4,800 x 1,200 dpi to deliver high-quality photographs, professional text documents, and solid copies. It is HP ePrint compatible and comes with built-in Wi-Fi. The HP Photosmart 6520 inkjet printer does not have an ADF. Measuring 17.32 x 21.73 x 6.3 inches and weighing 13.67 lbs, the HP Photosmart 6520 e-All-in-One printer features a 3.45-inch touchscreen display. It also has a flatbed scanner. The HP Photosmart 6520e can handle 80 sheets plus 20 photo papers. Memory card slots and a USB port are provided. 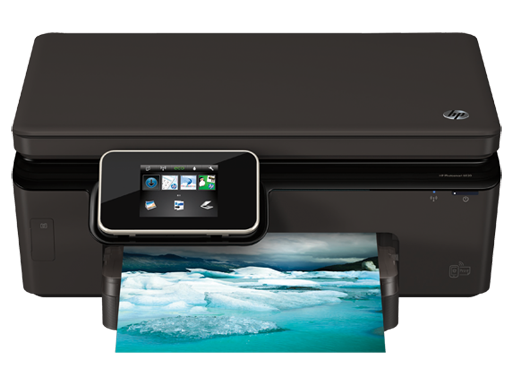 The HP Photosmart 6520e has a print speed of 22 ppm for both black and white and coloured output on draft mode. Users can expect consistent output from the HP Photosmart 6520e, from prints and copies to scans. The Photosmart 6520 e-All-in-One inkjet is very easy to use and printing photos is simple, it can be done through the computer, memory card slots, or through Wi-Fi from mobile devices or tablets. An automatic duplexer is built-into the unit for double-sided printing. The Photosmart 6520 printer does not support multitasking and lacks an automatic document feeder. The HP 6520 e-All-in-One inkjet printer could be better if it featured a PictBridge port for direct printing from digital cameras.